Many centuries ago, narrow terraces were hewn into the rocky slopes along the river Danube. Walls were erected to maintain these terraces. Today, these steps in the rock, with their thin covering layer of soil, bring forth wines distinguished by great elegance and an incomparable interplay of aromas. This dramatic segment of the narrow Danube valley between Melk and Krems, the core part of his possessions, was named VINEA WACHAU NOBILIS DISTRICTUS by Leuthold I of Kuenring (1243–1312). In our century, the vintagers of the legally protected wine-growing area Wachau have filled this ancient designation with new life. VINEA WACHAU is a regional association, which has set itself the goal of raising awareness of the unique natural conditions of the region, and of the ever challenging working conditions of the steep, terraced vineyards of the Wachau. 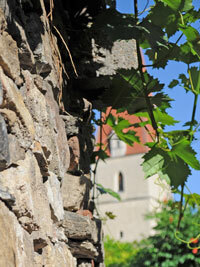 Founded in 1983, VINEA WACHAU created three categories for the classification of Wachau wines. Taking into account the unique climatic and geological conditions of the area, the designation “Steinfeder®” was introduced in 1984, followed by “Federspiel®” and “Smaragd®”. The wines are produced according to strict guidelines which exclude any chaptalization. 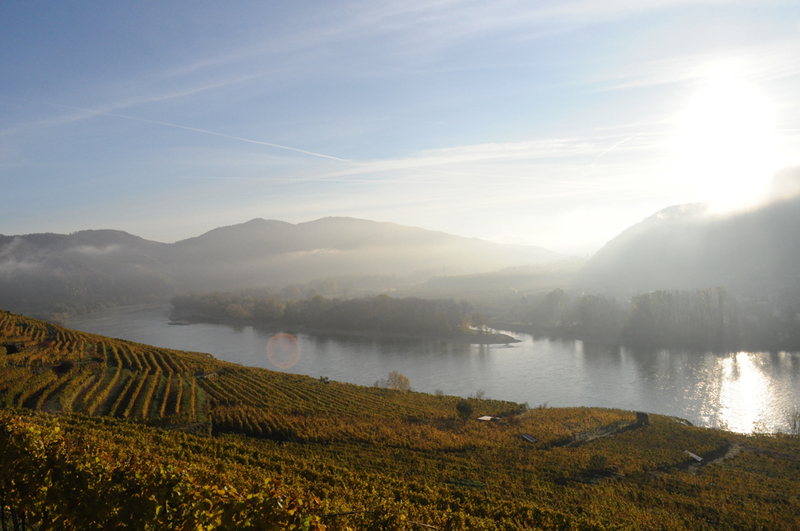 The designations are legally protected and can only be used by members of “VINEA WACHAU”. 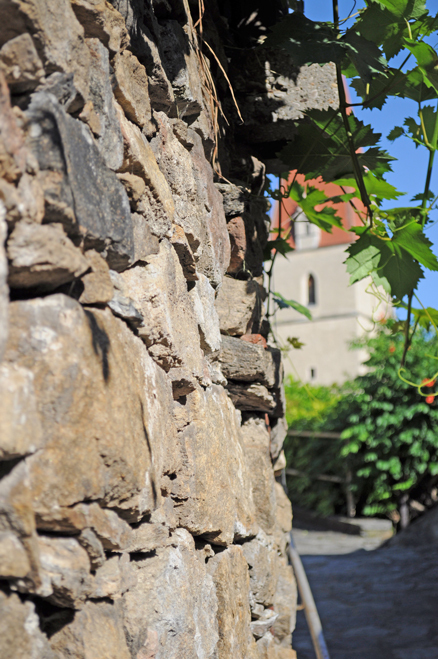 Apart from legal requirements, “VINEA WACHAU”also controls the quality of its wines by means of analysis, regulations of quantities and formal tastings. Sample bottles of each wine are kept to allow further controls. 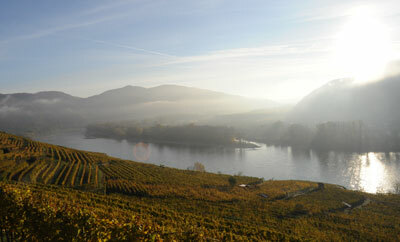 Members of VINEA WACHAU must exclusively sell from the Wachau area. Unique Microclimate Streaming downriver, the warmth from the Pannonian plains in the east provides ideal conditions for wine growing along the banks of the Danube. Like a giant mirror, the surface of the Danube reflects the rays of the sun, multiplying the light which is so essential for the generation of the sugar within the grapes. The primary rock of the terraces heats up in the sunlight and still warms the grapes after dusk or when the sun is obscured by clouds. The mixture of Pannonian and continental climates occuring here leads to considerable temperature variations between day and night, variations which are further emphasized by cool air from the side valleys and from the rougher Waldviertel region in the north, which comes flowing into the Wachau as if through an opened window. The constant circulation of air resulting from the meeting of different air currents, the sequence of hot days and cool nights, and the wooded hilltops constantly giving off aromatic forest air into the cineyards below are the foundations of the incomparable fruit and complexity of aromas of the Wachau vines. Fruity charm and a stipulated maximum alcohol content of 11,5% by volume characterize the lightest style of top Vinea Wachau wines, the Steinfeder®. The name itself refers to the typical "Steinfedergras” (Stipa pennata), which grows in the immediate proximity of the vines on the terraces of the Wachau vineyards and is just as feather light and airy as the wines named after it. Smaragd® is the name for the best, most treasured wines from the Vinea Wachau-members. The alcohol content of these wines begin at 12.5% by volume. This, along with the highest grape ripeness and natural concentration are what make this world-class designation possible. Emerald-coloured Idex lizards – also known as Smaragd - are at home in the terraced vineyards of the Wachau. On bright, sunny days, their beauty is highlighted dramatically as they bask in the gleaming sun next to the grapevines – the perfect symbol for the absolute top Wachau wines with full physiological ripeness. Built on rock Over the millennia, the river Danube has dug down into the rock formations for up to four hundred metres, creating a narrow valley with steep slopes and craggy rock faces. The turbulent past of these formations can be deducted from their different configurations, which display gneiss, marble, graphite and other minerals. The geological composition of the soil can therefore vary considerably in very confined spaces, thus lending very different characteristics to the vines and their aromas. As early as the time of Charlemagne, the monastic orders in the region realized this potential. Their work forms the basis of today’s wine culture in the Wachau. The unmistakable and strongly varied terrain is mirrored in the designation of the different crus (in German: Rieden). The reputation of the Wachau crus such as Loibenberg, Kellerberg, Achleithen, Klaus, Singerriedel and Tausend-Eimer-Berg is based on this individuality.